As long as you don't care about music quality, the Mini is a welcome addition to the Google Home smart speaker family. Talkative smart speakers are jostling for position at the heart of Australian smart homes, with the tiny Google Home Mini making it easier than ever to bring Google Assistant to life. Google has a head start in Australia's smart speaker war, while we wait for Amazon's Echo speakers running the Alexa smart assistant – which should arrive in the next few months along with Apple's Siri-powered HomePod. Following Amazon's lead with the Echo Dot, Google has unveiled the Home Mini as an affordable little brother for the $199 Google Home speaker. Both tech giants want to bring their talkative smart assistants to every corner of our homes, so interacting with them becomes second nature in the post-smartphone age. The Home Mini has the same footprint as the standard Google Home speaker, around the size of a 600ml carton of milk, but it's only a quarter the height so it's easier to hide away on your kitchen bench, coffee table or bedside table. A cloth top, available in a choice of three colours, hides four lights which shine when you have the speaker's attention. It doesn't start listening until you say "Okay Google", with the ability to recognise multiple voices, but there's also a physical switch to disable the mic when you want some privacy. While the speaker is voice-controlled, you can also tap the sides to manually adjust the volume. 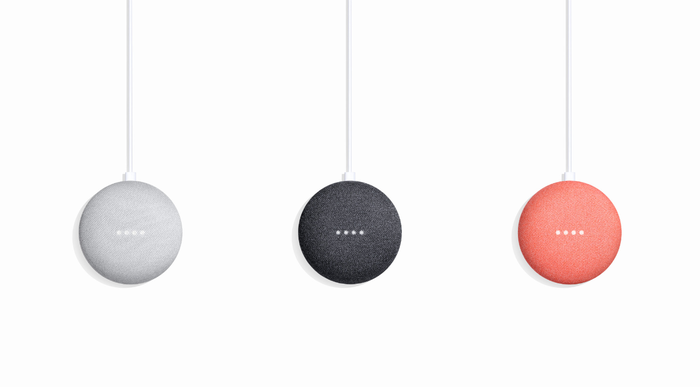 One frustration with both the Home and Home Mini is that they don't feature separate volume controls for the Google Assistant voice and music, so if you've turned it up to hear the voice across the room it's often too loud when you play music – streaming from services like Google Play Music and Spotify. Google is working on a solution for this volume issue, which will hopefully be in place before the Sonos-style Google Home Max speaker is launched – with its extra grunt you wouldn't want Google Assistant shouting at you.